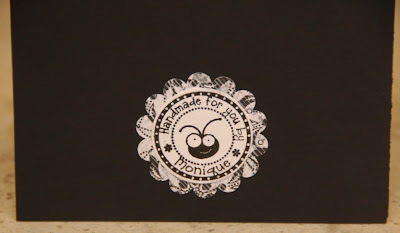 Simple Wedding Card & Blog Candy Cricut Stamp!! 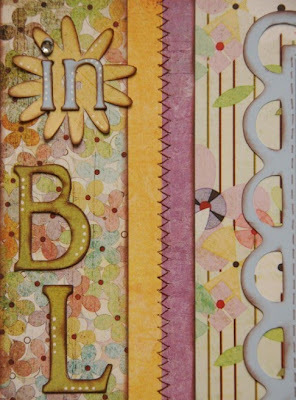 The new "In Bloom" layout is available to ship as a kit, or you can even take it as a class if you're in the Northern California area. 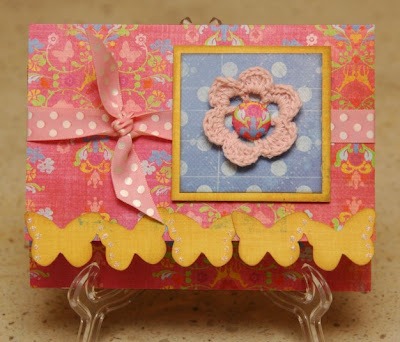 This layout is perfect for springy pictures of your little princesses. It uses Basic Grey papers (aren't they gorgeous? 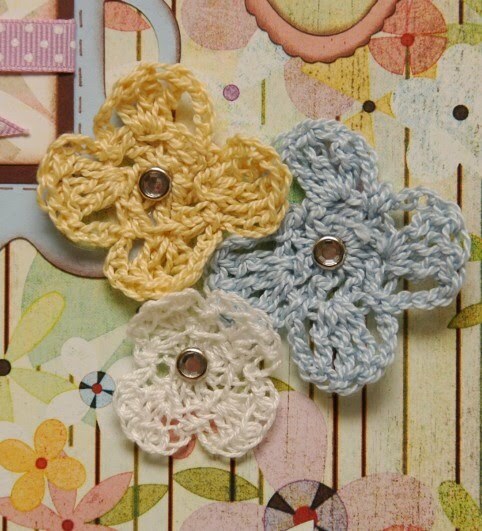 ), real zig-zag stitching (pre-sewn for you), hand-crocheted flowers, polka-dot ribbon, and even a touch of bling, giving this project a soft vintage feel. For you Nor-Cal locals, this class will be held Thursday, April 8th at 6pm here at my home in Rocklin. Space is limited to 25 people, and the class is already half full even though I'm just now releasing the pictures, so I do expect it to fill up quickly. 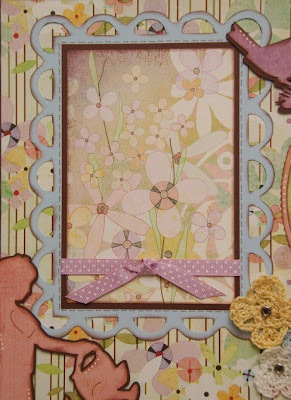 The class is $25, and includes the kit with papers, cardstock, ribbon, etc. See below for a list of what supplies you'll need to complete the project. Kits are also available for shipping, and will ship out by April 12th. 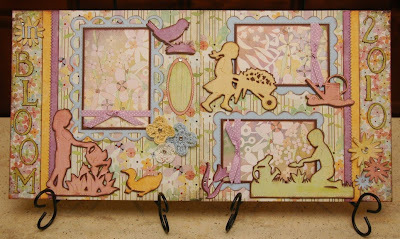 Kits are $25, and include all patterned papers, cardstock, ribbon, brads, crocheted flowers, and even some chipboard to pop the title up. You'll also get my full directions which are detailed, yet easy to follow. And they include my Cricut Cut Chart which shows you line by line exactly what to cut on your machine with all of the settings. Plus cuts are grouped by color to make it more efficient. There are also well-organized written instructions and plenty of color photographs. Shipping ranges from $5 in California, or $6 to $9 in the rest of the US, depending on location, and I'm happy to combine shipping. To order, email me at moniquegriffith@yahoo.com and include your state so I can calculate shipping. 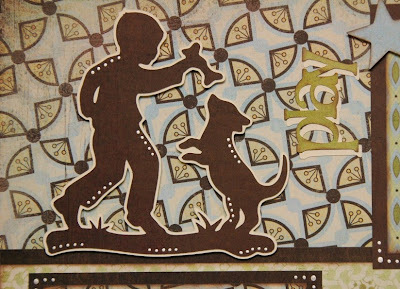 Here's a list of what you will need to complete this project as shown: Cricut Expression with mat and blade, A Child's Year cartridge (available HERE or HERE if you don't own it already), dark brown chalk ink (such as Versa Magic or Cat's Eye), 3D pop-dots, glue dots, white gel pen, brown marker, plus adhesive and standard tools such as paper trimmer, scissors, etc. And here below is the other new layout kit. We can't leave out the boys! To order, just email me at moniquegriffith@yahoo.com and include your state or zip so I can calculate postage. See below for all of the details. This layout is a Limited Edition kit. What that means is that it will not be taught as a class, and there are limited numbers available. When it's gone, it's gone, and I won't be making more. Plus it's only $20 rather than the usual $25. So these Limited Edition kits tend to sell out pretty quickly. Consider yourself warned! This kit will ship out by April 12th. The kits include all Basic Grey patterned papers, plus cardstock, brads, and full directions with Cricut Cut Chart and plenty of color photographs. The kit is $20. Shipping ranges from $5 in California or $6 to $9 for the rest of the US depending on location. I'm happy to combine shipping if you're ordering more than one kit (max shipping charge is $10 for shipping upto 8 kits). See below for list of supplies that you'll need to make this layout. To complete this layout as shown, you'll need the following items: Cricut Expression or Create with mat and blade, A Child's Year cartridge (available HERE or HERE if you don't own it already), dark brown chalk ink (such as Versa Magic or Cat's Eye), 3D pop-dots, silver or white gel pen, tiny hole punch for brads, plus adhesive and standard tools such as paper trimmer, scissors, etc. Again, to order this kit or the "In Bloom" kit or any of the kits shown in the slide show at the top of my blog, just email me at moniquegriffith@yahoo.com and include your state or zip so I can calculate postage. I prefer PayPal, but also accept checks or money orders. 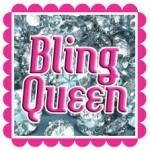 Thanks for checking out my blog. And btw, I'm getting soooooo close to 1000 followers, and plan to celebrate with several great giveaways when I hit the mark, so make sure you're a follower, and tell your friends and then stay tuned for more info! "Love the card! I guess I will have to add those to my wish list! If I was the lucky winner of this week's blog candy I would want the stamp to say "Handmade for you by - Carrolyn"
Congratulations, Carrolyn! I will email you! And thanks so much to Stamp Out, our sponsor for this giveaway. Don't forget to check out their website HERE. 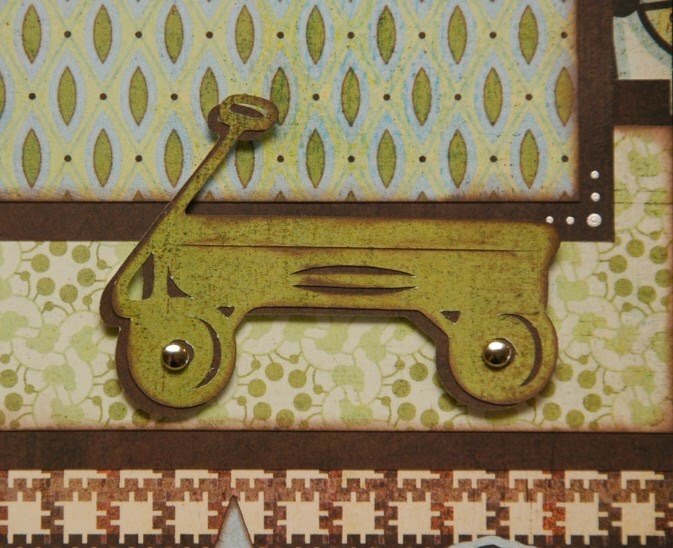 I used the Card feature on page 39 of the ACY cart, and set my size to 6 1/2". This card feature option is amazingly useful on this cart, and if you use the 6 1/2" size, it'll fit perfectly in a standard 5x7 envelope. 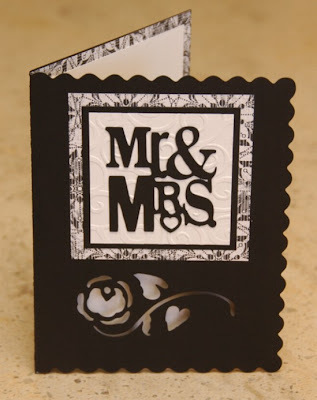 So this gave me the black card with the scalloped edge, and the rose cut out of it. 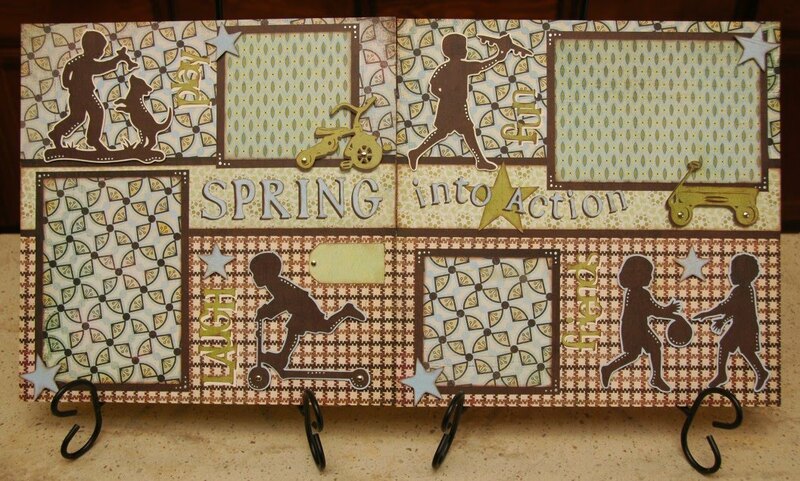 I then switched over to my Stamping solutions cartridge. This cart is NOT just for stamping! 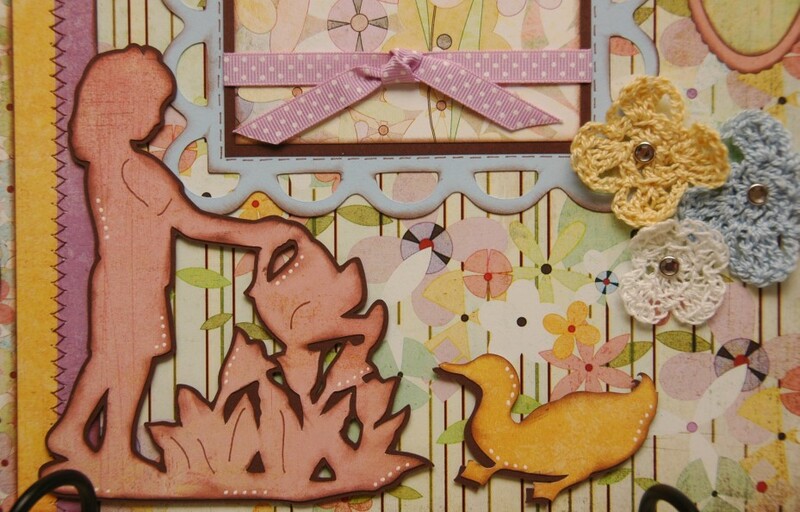 It's got soooo many fantastic phrases on it, and is a dream come true for card making. I cut the inside phrase "Forever & Ever" at 1 3/4"(I think), and then switched to my Sweethearts cart to cut "Mr. & Mrs." at 2 1/4" (I think. What can I say? I was in a hurry, LOL!). 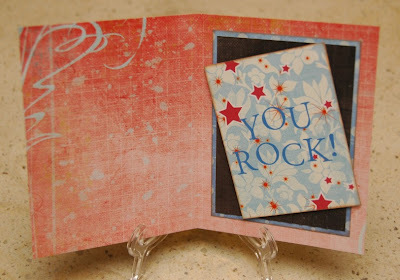 For the front of the card, I used my paper trimmer to cut a white square at 2 3/4" x 2 3/4". The black square is 3" x 3", and the patterned square is 3 1/2" x 3 1/2". I used my Cuttlebug to emboss the white square with the Divine Swirls folder, then layered and attached the pieces to the front. 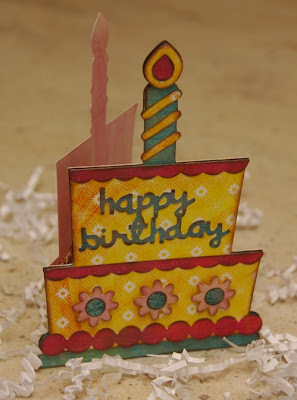 For the inside of the card, I used the patterned paper to exactly line the inside. I think those dimensions were about 6 1/2" x 5". 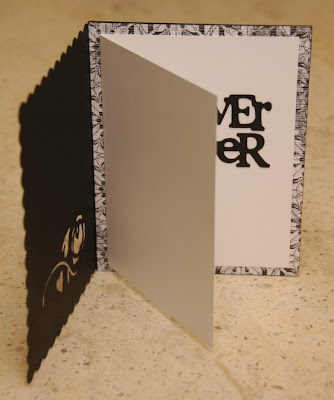 I then folded a white piece of cardstock into a card, and cut it so that it measured 6" x 4 1/2" folded. 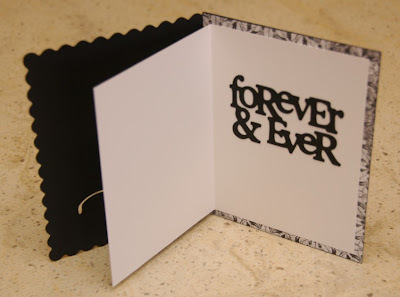 This was then glued onto the patterned mat so that it perfectly frames it, and then the "Forever & Ever" sentiment was glued to the inside. Ta-da! 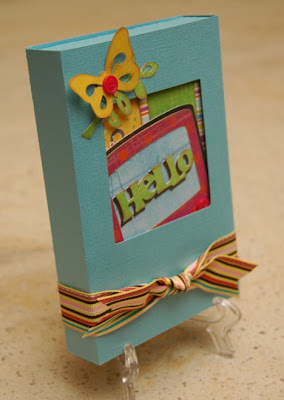 I always love to do this "card within a card" technique when I have a window-cut card. And for the finishing touch, check this out!! A super sweet client/friend of mine named Stephanie Webster-Talley surprised me by ordering me this fabulously CUTE bug head stamp from Stamp Out HERE with my name on it!!!! I was floored by her thoughtfulness, and couldn't wait to use the stamp. (Thanks again, Stephanie!!) 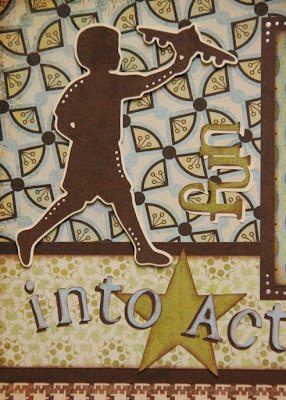 And as it turns out, my Stampin' Up! 1 3/8" circle punch fits it perfectly. 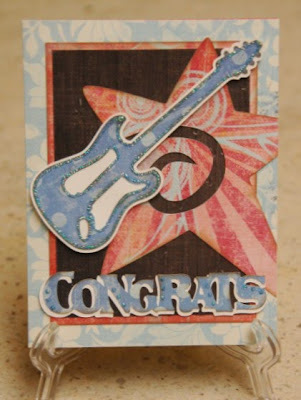 So I stamped it on white cardstock and punched it out. 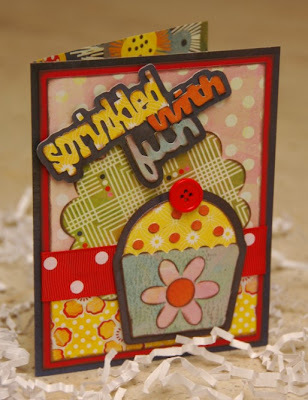 I then used my Stampin' Up! 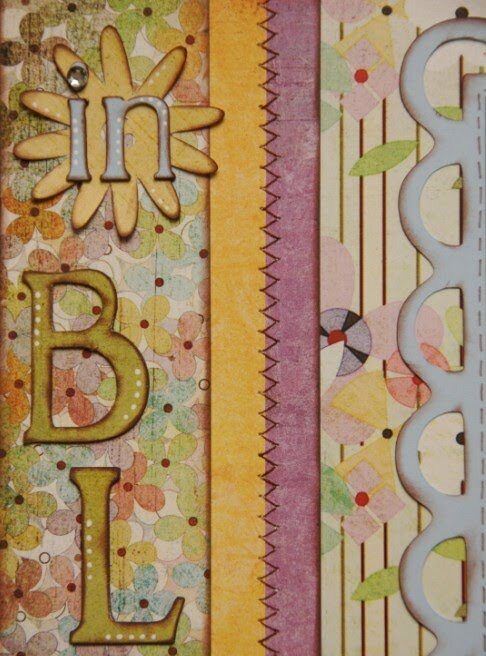 scalloped circle punch on the patterned paper to create a perfectly coordinating border around it. How fun is that? So this leads me to the BLOG CANDY!!!! 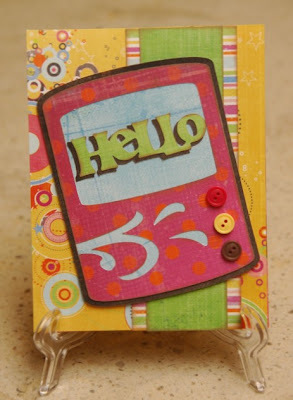 The winner will receive their very own Cricut bug head stamp donated by Stamp Out with their choice of name on it. 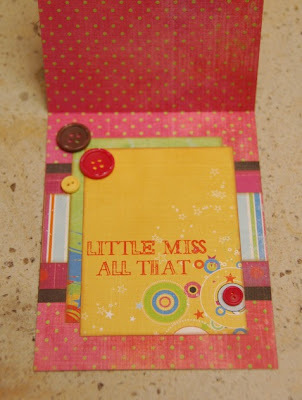 You can even customize the wording if you want - or pick from a zillion other super adorable designs. I even ordered one with my website name around the bug head! So here's how you enter: Just make sure you're a follower of my blog. Then check out the Stamp Out website HERE and then leave a comment under this post letting me know what you'd want on YOUR stamp if you win! And make sure you leave your email address or your Cricut messageboard name in your post so I can contact you if you win. You can also get an extra entry by posting on the messageboard thread HERE. I'll do the random drawing on Tuesday morning, March 23rd around 10am pacific time. Good luck!! LadybugCarrie who said "Wow - you are so creative! Wish I lived on the other coast so I could attend your classes! Thanks for the chance to win!" Congrats! I will contact you through the messageboard. 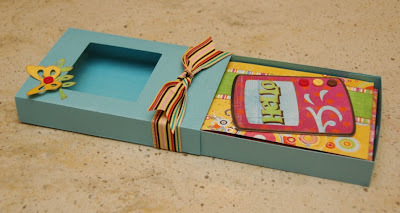 Sweet Treats Party Class & Blog Candy Cartridge!!! I'm giving away a Sweet Treats cartridge!!! 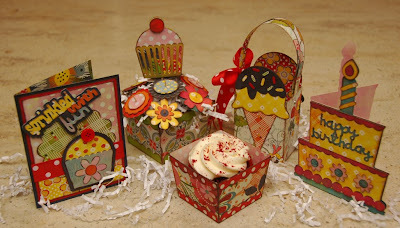 This Sweet Treats Party project is available as a class and also as a kit. For you NorCal Cricuteers, the class is coming right up. It will be held on Thursday, March 18th at 6pm here at my home in Rocklin. The class is $25, and includes materials. Space is limited to 25 people, and most classes sell out quickly. 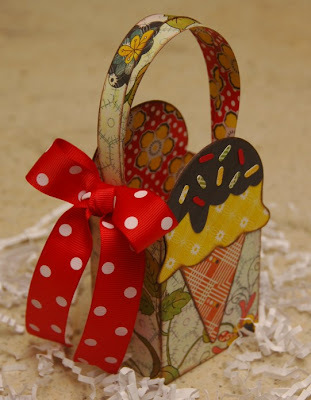 Kits are available as well, and include all papers, ribbon, brads, etc. Plus you'll get detailed, yet easy to follow directions with my Cricut Cut Chart, which shows you line by line exactly what to cut on your machine with all of the settings. There are also well-organized written instructions and plenty of color photographs. Kits are $25. Shipping is available, and is $5 in California, and ranges $6 to $9 in the rest of the US, depending on location. Kits will ship out by March 22nd. To sign up for either the class or the kit, just email me at moniquegriffith@yahoo.com. Be sure to include your zip code so that I can calculate postage. I accept PayPal, checks or money orders. I'm also happy to combine shipping, and you can check out my other available kits in the slide show at the top of my blog. Keep in mind that some of these kits are *very* close to being sold out. 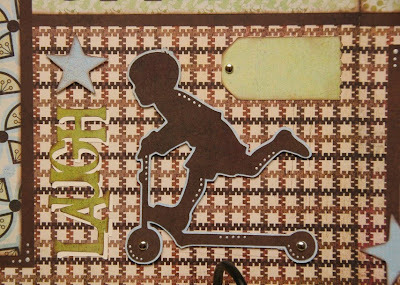 To complete this project as shown, you will need the following supplies: Cricut Expression and mat, Sweet Treats cartridge, dark brown or charcoal chalk ink, 3D pop dots, mini glue dots, ruler and scoring bone, tiny 1/16" hole punch or paper piercer, adhesive and standard tools such as scissors and paper trimmer, etc. 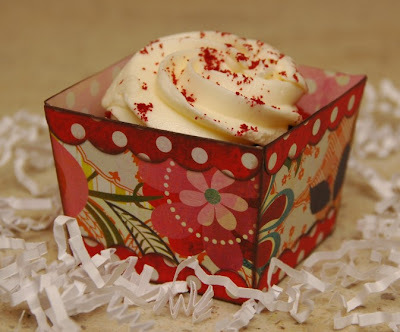 Actual cupcake is not included, but it's the red velvet cupcake from Starbucks - Yum!! If you don't yet have this super fabulous Sweet Treats cartridge, you can purchase it at Hallmark Scrapbook HERE or at Oh My Crafts HERE. Or, you might just get lucky and WIN the cartridge here on my blog!!! Yes, I will be giving away a brand new Sweet Treats cartridge! Just make sure you're a follower of my blog, and then post a comment here on this post. Be sure to include your email address OR your Cricut messageboard name so I can contact you if you win. You can also enter by leaving a comment on the messageboard thread HERE. 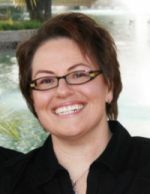 I will draw the winner Wednesday morning, March 10th at around 10am pacific time, and will post the winner here on my blog. Thanks for partying with me. Now let's turn up the music and shake a tail feather!!! I'm so excited to show this project!!! I designed it exclusively for Oh My Crafts for their Bus Tour. It will be taught in at least 3 cities, possibly more. See below for details and info on how to sign up. 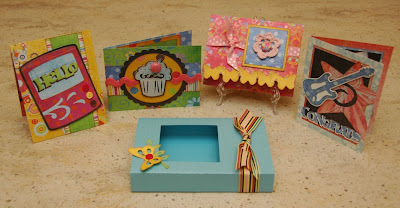 In this class, you will make 4 bright and happy cards plus a gift box. 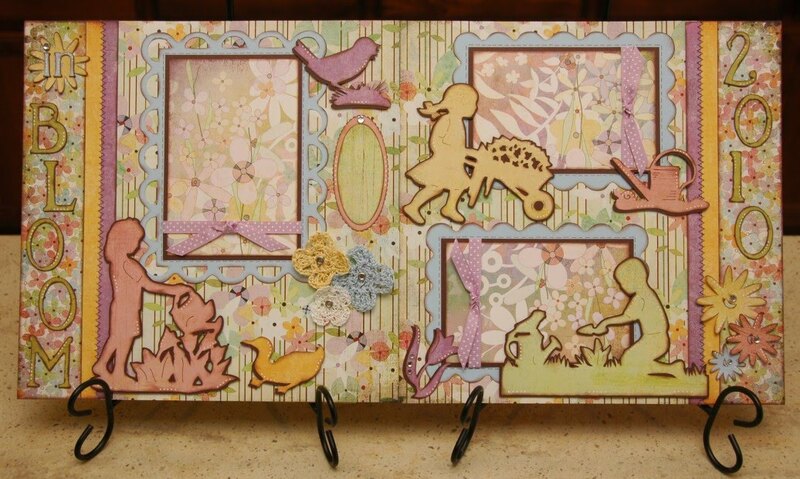 Nearly all of the paper and other embellishments are from Fancy Pants Designs. 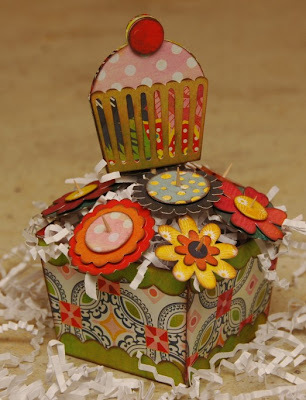 The box itself is created from Bazzill Bling cardstock. Yum! You won't even need a Cricut to take this class, as they will have all the Cricut work pre-cut for you - how cool is that? 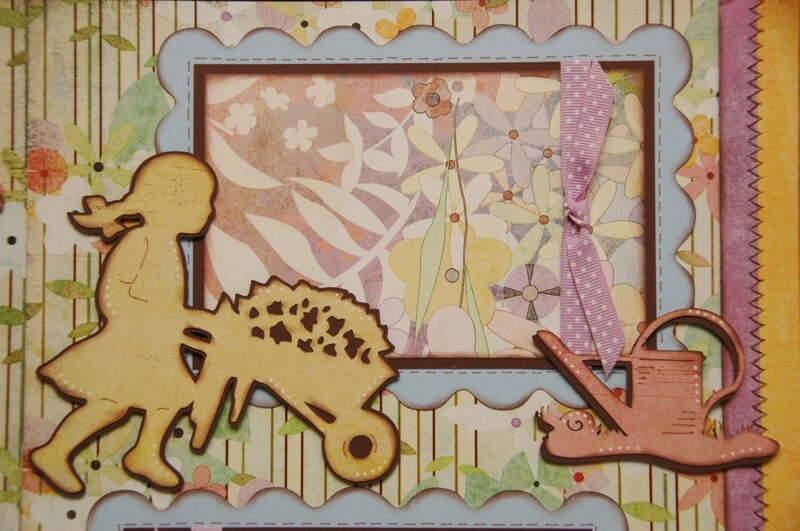 But you'll still get to play with several techniques including chalk inks, Stickles, Cuttlebug and even the i-top brad maker. To take this class, you'll need to sign up directly through Oh My Crafts. The class is only $20, and these are the locations that this class will be taught (that I'm currently aware of - more may be added). Click on the city below for more info or to sign up. Spokane, WA - March 23rd. Redding, CA - March 27th. Minden, NV (Lake Tahoe area) - March 29th. Sign-ups for these locations end on March 10th, so hurry if you're interested. I will personally be teaching the class in Minden, NV. The other locations will have special guest teachers. Btw, I will not be selling kits or directions for this class. OMC may offer kits after the bus tour, but no guarantees on that. I sure had fun designing these, and truly hope that some of you will be able to take the class. Thanks so much for stopping by today. 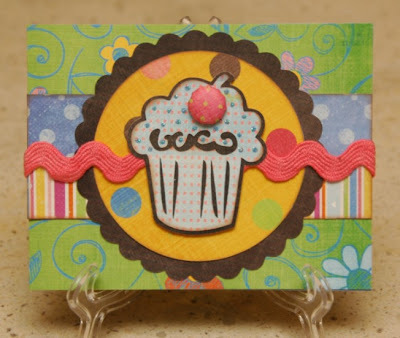 Look for a new Sweet Treats Party project to be introduced later this week!